The S&P 500 rose 0.33% on Friday, capping the first four-day gain since last October, after February's non-farm payrolls exceeded forecasts and the Energy Department said domestic crude oil production is trending lower. The U.S. added 242,000 new jobs last month, topping economists' consensus projection for 191,000, while net revisions the prior two months added another 30,000. The unemployment rate held steady at 4.9%. Crude oil production fell a sixth week, as production declined from the Organization of the Petroleum Exporting Countries (OPEC) due to pipeline disruptions in Iraq. Last week's strong gains capped the S&P 500 with a third weekly gain, up 7.41% over the period, its best three-week advance since 2014. Last week also included a busy economic calendar, with pending home sales slowing 2.5% in January. The Institute for Supply Management's (ISM's) manufacturing PMI for February exceeded estimates (49.5 vs. 48.5), and construction spending surged 1.5% in January, up 10.4% year-over-year (YoY). Chart of the Week: Bull Market's Birthday Fast Approaching; Will it be Six or Seven Years? Data from S&P Capital IQ shows that the current bull market, born on March 9, 2009, needs to officially set a new high before recording its seventh year upward milestone. Technically, however improbable, if a 20% stumble occurs first, the birthday crown would be revoked. The record books re-written to show the bull market had instead ended on May 21, 2015. That's the date when the S&P 500 reached its most recent peak of 2,130.82. In this hypothetical scenario, it would show the bull market lasted six years. At present, using Friday's 1,999.99 closing level, the S&P 500 is down just 6.14% from its May 21 record high. Should a new high be attained in the near future, however, investors will look back upon this seventh year as a challenging one. By size, as the above chart shows, large-caps (S&P 500) have fallen the least, down 3.8% (1-year, YoY). Small-caps (S&P 600) tumbled 5.3% and mid-caps (S&P 400) slumped 6.2%. 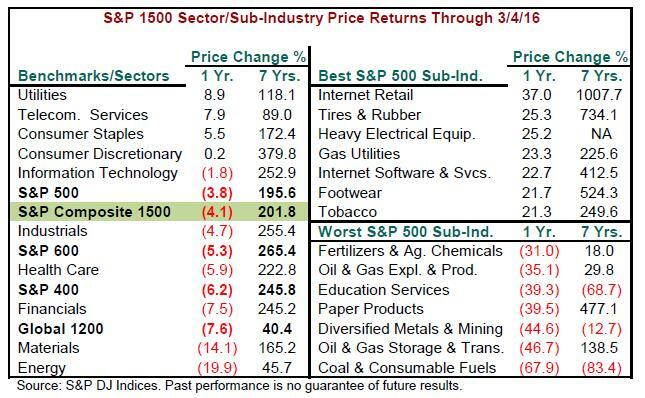 Not surprisingly, all benchmarks and sectors are higher since the birth of this bull market, with the S&P 1500 Consumer Discretionary sector up the most at nearly 380%. Energy gained the least at 45.7%. On a sub-industry level, only one third of the groups rose in price on the year, led by a 37% gain in Internet Retail. Surprisingly, this group's cumulative bull-market advance of about 1008% was not the top cumulative performance. That distinction goes to Catalog Retail with a surge of 1393%. The worst performance for the year went to Coal & Consumable Fuels, which was down almost 68%, and recorded a more than 83% decline during this entire bull market, the worst cumulative return of any S&P 1500 sub-industry. Assuming this twelfth bull market since WWII is still alive, it has lasted 84 months, as compared with the average age of 56 months. It rose 215% through its May 21, 2015 all-time high, versus an average price advance of 144% for all bull markets.